What is most important to Rusty Gordon, owner of Ghost Island Farm, is that CSA members feel they are part of a community, that they feel comfortable and at home, and that they are actually part of the farm that they are helping to sustain. Ghost Island offers a different approach to the traditional CSA model, allowing members to choose what they want and purchase on account with a discount. Members and farm stand customers alike can go out into Ghost Island’s organic (non-certified) fields if they want, to pick a particular product or just to show their kids what’s growing. Purchasing program for up to 250 members. Buy an annual half share ($250) or a full share ($500) and choose exactly what you want at any time, receiving a 10% discount on the farm-raised produce you buy, on account. 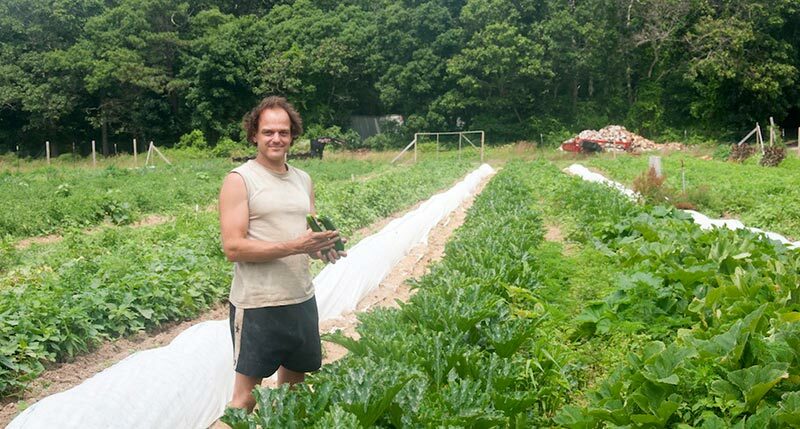 For Rusty Gordon, founding Ghost Island Farm in 2012 was an outgrowth of 20 years of managing a neighboring farm, Whippoorwill, and running its CSA program, the largest at the time. Rusty believes that farming and customers help each other. Customers help the farm sustain and the farm helps them, by being here, by growing what customers want, and by giving them a good product. He takes pride in growing 70 varieties of tomatoes, 20 varieties of kale, baby salad mixes and other mixed produce, all using organic methods. The seed is untreated and non-GMO, they use Vermont Compost organic soil for seedlings and fertilize with North Country Organics for crops. Insects are controlled naturally and except for water, they do not spray their crops with anything except water. Visitors to Ghost Island’s farm stand will experience Rusty’s sense of humor and if you’re a CSA member, be able to pick a bouquet of flowers to take home, on the house.